Want to have your very own chandelier and that is unique yet different from the others? We can make our own at home using used goods like unused glass bottles. Here are adorable tips and how to make a pendant from an unused bottle. 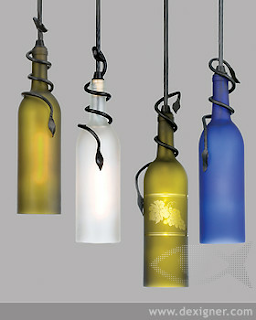 Here's how to make a chandelier from this glass bottle. We need to process the glass bottle first, like cutting some glass bottles. After you finish cutting the glass bottle, you can arrange it into an interesting chandelier. 1. Prepare a glass bottle to be cut, then take a piece of string that you have prepared. Wrap the rope around the body of the bottle to be cut to measure the circle of the bottle. 2. Then loose the rope tied to the bottle. 3. Prepare a container containing liquid spritus or kerosene, soak the rope in the liquid spritus or kerosene thoroughly. 4. Lift the rope from the spritus liquid container if it has been submerged, then tie the string back to the bottle on the part to be cut. 5. Burn the rope on the bottle, and rotate the bottle to burn evenly. 6. If you begin to hear the sound of cracks in the bottle, and the rope has started burning soak the bottle in a container of cold water. Allow the bottle until the burned part is released. 7. After the bottle is cut off, you can tidy up the sides with sandpaper to keep it flat and tidy. Once your glass bottle is cut off and has already passed several stages of welding finishing, it's time you string your chandelier. 1. Prepare light bulbs, lamp fittings, and cables. 2. Before the lamp is inserted or placed inside the bottle, install the fitting and plug the cable circuit first. 3. Then after the lights, fittings, and cables are mounted, insert the lamp into the bottle. 4. After that you can test your chandelier, can flare perfectly. 5. When you're done, you can start hanging or stringing chandeliers in the sky.